It’s been six weeks since Officer Darren Wilson shot Michael Brown, Jr. in Ferguson, Missouri. The intervening weeks have told us much about issues of race in America, little of it good. Media coverage of the protests were mixed at best and not able to get to real grievances (perhaps because the media wound up in the middle of the story for awhile). Autopsies were performed, eyewitness testimony was reviewed, and a grand jury has been established. For a variety of reasons common to situations like Ferguson, it’s fairly unlikely that there will be any outcome that will satisfy those following the story. I keep following the stories. They are heartbreaking on many levels. They’ve also provided excellent teaching material. I opened my Spirituality, Faith, and Justice class two weeks ago reflecting on Ferguson. I divided the story into three levels: the shooting, the protests, and the larger structural backdrop. This past week we celebrated Constitution Day at Spring Arbor by showing the documentary Freedom Riders (you can watch the whole thing on the PBS website here). It’s the story of a group of students: black and white, male and female, who decided to ride interstate buses (Greyhound and Trailways) into the deep south in 1961. My American History colleague Mark Edwards debriefed the film and talked about the significance of the 14th amendment extending the bill of rights to the state (as well as guaranteeing due process) regardless of race, gender, or religion. I talked about the Bill of Rights and how aspects of the Ferguson situation appeared to infringe on at least half of those 10 amendments (first, fourth, fifth, sixth, and eighth). But the movie underscored something I’ve been pondering for awhile: our focus on individual racism continually distracts us from institutional racism. 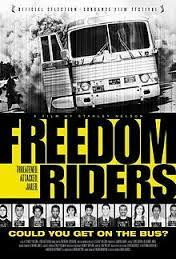 The Riders were going in to the South specifically to engage in civil disobedience against Jim Crow laws. At the time, bus station waiting areas were segregated with clear signage stipulating white waiting areas from colored waiting areas. A Supreme Court decision declared segregated buses unconstitutional but the decision had been ignored in the south. The riders would also sit in restaurants with blacks and whites at the same table. Their task was to expose the institutional racism that was rampant in the deep South. When they get to Anniston, AL, one of the buses is surrounded by an angry mob who then firebomb the bus. The other bus gets to Birmingham and there is a violent attack with men and women beaten with fists, bats, and chains. The anger and racial animosity from the attackers is overwhelming. The media is outraged (there’s a remarkable newsreel from Russia condemning America complicity) and the Kennedy administration reluctantly gets involved. After the violence, the original bus riders return home. But they are replaced by a new group from Nashville. Their story is even more fascinating as they are first trapped in a church in Montgomery, and then are arrested in Jackson, MS and immediately put into prison. More and more people come to Jackson just to be arrested and imprisoned to point out the lack of legal recourse and thereby force change. The most vivid images are those of angry bigots and self-serving political figures “protecting their culture”. It’s harder to see the legal system that was bent to protect their interests. Which brings me back to Ferguson. As I have written, we seem to fixate on the motives of individuals. Was Officer Wilson reasonably responding or singling out Michael Brown? Was Brown a thug who didn’t respect authority? Can you trust the eyewitnesses? Are the prosecutor’s motives in question? This is also the dynamic when we interact about Ferguson on social media. Share the Facebook post raising questions about the distance between Wilson and Brown or the video of the construction workers, and there’s a chance your grandmother will post on your wall that Wilson acted honorably and you should be ashamed of suggesting he was a racist. Then you get the standard meme of someone misquoting Martin Luther King’s Dream speech by suggesting that we should all just judge people on the content of their character. Or the person who asks the inevitable black-on-black crime question. Or the one who starts talking about challenges in black families. Point out that these are the wrong questions and the speaker will act like you’ve called them a bigot. They will get defensive and shift blame to something else. And if you push back, you’ll get a response that they aren’t racist but simply refuse to be politically correct. So I have a proposal. Nobody is a racist or a bigot for the next five years. Ask any question you want. Make any statement you want. I will not raise doubts about your commitment to racial harmony. I won’t police your language or tell you that I don’t appreciate your joke. Have at it. You aren’t a racist — at least until 2019. For the next five years we will only talk about institutional racism. We will talk about the kinds of structural inequities that Ta-Nehisi Coates described in The Case For Reparations. We will talk about Michelle Alexander’s The New Jim Crow and the impact of non-representative incarceration. We will talk about the issues of educational quality raised in the sociological study The Long Shadow (that I just started) which shows the barriers to advancement experienced by a sample of school children in Baltimore as they grow to adulthood. We will talk of political representation and equal opportunity to cast ballots in elections. We will talk about differential enforcement of laws and police departments treating neighborhoods as militarized zones. We will talk about a shifting economy that leaves behind segments of the population. We will talk about the linkages between suburbanization and urban decline. We will talk about government programs that do harm to black communities in the guise of providing assistance. We will talk about gangs and drugs and the challenge of local neighborhoods. As I’ve written before, King’s Dream speech has a tremendous laundry list of institutional wrongs. It was only as those were addressed that we get to the children holding hands and singing Free at Last. Like the Freedom Riders, we need to pay attention to the important things: legal structures, legitimated practices, economic incentives and disincentives. Maybe if we pay attention to these issues for five years we can begin to make some change without seeking to charge people with prejudice or bigotry. Maybe, just maybe, if those folks really understand the difference institutional racism makes, they will be less likely to hold on to their judgmental attitudes. Hi John, thanks for writing this. I appreciate proposals and the work, positivity and creativity that go into them! Thanks for taking the time to do something proactive. I especially appreciate your emphasis on institutional racism; I agree that it is much-needed! That said, I wonder if your “moratorium on talking about individual racism” is actually oppressive to people of color whose stories of individual racism will be silenced under the moratorium. In order words, I wonder if your privilege is showing? This past week, one of my dear friends spent an afternoon with me at work at Bethel. At the end of the afternoon, she said me, “In the three hours I’ve spent with you, I’ve witnessed various Bethel community members launch 3 or 4 racial microaggressions at you. Are you *always* the target of this many microaggressions?” I responded with a “yes” and a deep sigh. The fact of the matter is that I *am* a target of individual racism at Bethel. (And students of color are probably targeted even more! Indeed, simply attending class is a non-stop assault on their identities…precisely because their fellow students are publicly asking the very questions that you are promising will not earn them the label “bigot”. ) To put a moratorium on talking about such experiences, might be helpful for defensive white people, and perhaps helpful for privileged white allies who don’t have personal stories to tell, but it won’t be helpful for people of color. Somehow, some way, I believe that we must continue to frame the conversation in terms of institutional acts of racism AND individual acts of racism. For a long time, we’ve ignored one at the expense of the other. In my opinion, it would be a mistake to do that again. Thanks, Christena, for your reflections. First, the title was supposed to draw some parallels to Swift’s Modest Proposal. It’s not a real idea in that I would be mortified to actually give people a free pass on microaggressions of any type, to say nothing of the more blatant forms of individual racism. Second, I’m certain my privilege is showing. In terms of being white, male, and an academic to boot. I’m working on this, but I was also trying to use my sociological perspective to leverage the larger structural issues confronting our society. Third, I wish I could agree with your closing paragraph. I feel like we’ve ignored both individual racism and institutional racism and never looked at one or the other. True, we may push bigoted attitudes under the surface for awhile but there is too much lingering assumptions along the way. And we only deal with institutional racism on those rare occasions where it proves embarrassing (and we only do so to make the single situation go away). Finally, I think your book is a great step forward (my students are really enjoying it). But I’ve been really distressed at the way that situations like Ferguson have allowed people to revert to a host of previously held racial attitudes. One of the issues of dealing with things like differential incarceration is that we allow people to entertain fictions that it is somehow explainable by culture, family issues, rap music, video games, or innate character. Somehow I keep wanting people to address the general question of injustice rather than focusing on their own attitudes to people of color.